How's patch 8.0 treating you so far? How’s patch 8.0 treating you so far? My addons are broken. Not all of them, but a few key ones that I kind of depend on, like my beautiful unit frame addon, and my precious bag addon. I’m sure they’ll either be updated in due time, or I’ll find some kind of worthy replacement — but for now, the game feels just a little off for me. Other than that, 8.0 seems pretty nice for now. I logged on to a brand-new title right out the gate due to my obsession with reputation grinds, my bars all seem to be in order, my health is smaller but hey, so is everyone else’s. It all evens out, right? I have to admit I’m a little sad that my days of raking in vast quantities of gold via missions are over — at least until Battle for Azeroth invariably introduces some kind of replacement. 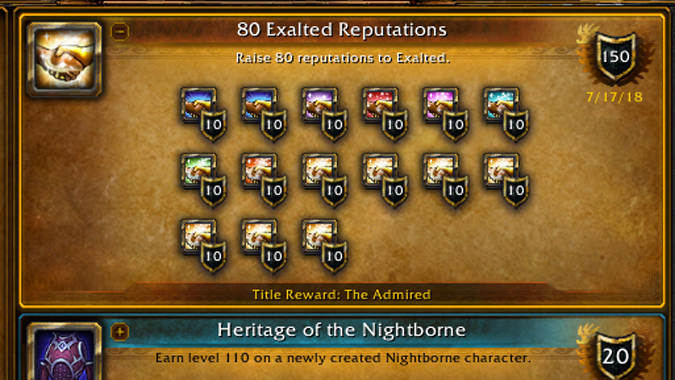 I’m also mourning my achievement points just a little. Due to the removal of First Aid and the retirement/Legacy-fying of some other achievements, I’m down about a thousand points on my total. Don’t get me wrong, they don’t amount to anything in the long run, it just hurts to see them take a hit. Regardless, things are pretty okay. Assassination Rogues didn’t get hit too hard by all the talent reorganization. I’ll miss my Artifact and its crazy powers, but I’ll survive without them. I don’t have a new rotation to learn or anything — just some new, smaller numbers to look at while I’m happily stabbing enemies. I sort of wish at least some of the story elements were in place already, but I’m okay with the hold-off. Not everyone is having an easy transition here, so it’s nice that people are getting a little time to get used to things before the story ramps up again. How are you guys doing? Is your favorite character still playing well enough to keep you happy? Do you have any addons you’re not-so-patiently waiting to be updated (Adibags, I’m looking at you)? Did you get any new achievements when you logged in to 8.0 for the first time? How are you handling the class changes? Let’s hear how 8.0 is treating you so far!